uossm | Fifth Hospital Attacked Within 7 Days, Idlib The New Aleppo? Another hospital was attacked and put out of service today in Kafr Nabl, Idlib. The Sham 4 hospital in Kafr Nabl was attacked at 6:30 a.m. Damascus time by three airstrikes, one of the missiles penetrated through three stories of the building, causing major destruction and putting the hospital out of service. 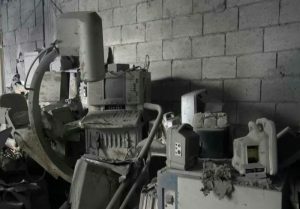 According to Hama Health Directorate the hospital was damaged along with medical equipment, emergency vehicles, and the electrical grid. The hospital director, Dr Maram Al-Shaykh Mustafa said, “We can’t even fully evaluate the extent of the damage because of how bad it is.” The hospital provided care to a catchment area of 600,000 people, serving 4,000 patients a month and performing 400 surgical operations a month. In the past week four other hospitals were attacked, three were completely put out of service and the fourth is partially operating. According to sources on the ground, in the past 72 hours there have been over 500 airstrikes killing over 45 civilians, and targeting medical facilities, Syrian Civil Defense Centers, and even a school which sheltered internally displaced persons. In light of the new wave of hospital bombings in Idlib, UOSSM has launched a petition to governments around the world to stop the attacks on health care workers. The ‘Doctors In Danger’ petition has already received over 44,000 signatures in under a week. We kindly ask the press to share this petition.